Monitors/Laptops screens; That jitter and that don't!! Bongofish > Screen Tablet malarky > Monitors > Monitors/Laptops screens; That jitter and that don't!! Ok so I want to start a thread similar to the "Good Monitors" thread but with some rules. That's it. Just feel it might make selecting new panels easier for future Diy Cintiq builders. Re: Monitors/Laptops screens; That jitter and that don't!! 7. Heavy shielding of the tft circuitry was required. A modified power source was also used, and ccfl backlight was removed. Aerandraca, I' ll follow you up with the widely used 1503fp and my own experience with the LP150E05 A3K2. 8. Yes, although I would suggest looking for an alternative as the color and resolution as well as the viewing angles of this monitor aren't all that great. 2. 2. Jitter is only slightly noticeable, I did get a nasty effect of the Wacom actually interfering with the screen, causing lines on the lcd, pinpointed this issue to the bottom circuit of the screen, so some shielding might fix the issue. 6. Tried powerstrip to change the frequencies, ended up with 67 Hz causing the least interference lines on the screen, altough they were still there. 7. Beware of tablet interfering with this screen, I have no idea why or what, or if it is just my tablet being annoying. Should be fixable though. 7. Most of the interference using this panel comes from the R.RM3251 or R.RM5451 controller as opposed to the TFT circuitry. Very easy to shield. There are lots and lots of variants of this screen, and not all are easy to strip. Try to find the exact B154PW01 panel if at all possible. Exhibits strong dropout effect in three separate panels before shielding -- the pens does not communicate fluidly with digitizer. Instead, it skips across the screen, with localized deadspots that do not respond to cursor movement even when the pen is pressed directly against the screen. 4. B141PW01. Also compatible with LP141WP1(T#)(##) -- equally difficult to strip. 7. Same as above, most of the interference comes from the controller board as opposed to the TFT circuitry. Stripping is virtually impossible without specialized tools and an extremely delicate touch, could be stripped more easily if you are willing to break the CCFL and install replacement afterwards. In my panel at least, the CCFL bulb was attached at both ends to one metal bracket, and glued to another metal bracket in the middle, making it a very delicate panel. Could be the best size with the Intuos4 Large (Allows for the entire screen to be used with no deadzone at edges). 2. 9-10 with and without shielding, shielding of TFT circuitry and controller board (R.RM5451) with 3x layers 2.0mil copper, conductive adhesive. 7. It was very surprising that an LED panel resulted in so much interference. The pen cursor had approximately 8 false clicks per second, and bounced around within a 14mm circle at 2cm from the TFT circuitry. In the middle of the screen, cursor jitter was still around 5mm with random clicks once every few seconds. Excessive shielding of every piece of circuitry and wire was completely ineffectual, even with multiple attempts at grounding the shielding both to the wall ground and the signal ground. Tested with two screens and two controllers. My two cents based on the cabroontiq build. 2. 0.1 on the center area. 9-10 on the 3 cms left edge (where the led strip is), random clicks on the top left menu bar area. No pen dropouts. 5. Natural screen resolution 1920x 1080 . resolution used for your build: 1680x1050 image warps a little when rotated. 6. Did you use Powerstrip (or equivalent) to improve the jitter: I tried but powerstrip only gave me two choices for screen refresh rate, 60 and 59 hz, and there was no diference with both. 7. I plugged it to my older laptop and the jitters were virtually none on the center part, maybe a graphics card thing? and reduced greatly on the edges. Grounding and isolating the display the leds and the circuitry made almost no difference. 8. Would you recommend this screen: Yep. this monitor is very resistant, only one circuit panel on top, 6 mm thickness of the whole screen , external control board with long ffc cables, which makes it easier to handle during the testing stage. Almost perfect fit for a 12 x 19 tablet. Even with the jittery areas, it still gives you lots of space to work with. I still recommend it. Recomendation to everyone, plug your build to a different computer. That might reduce or eliminate jitter. 7. The room ground dispersal is shot, so the build receives noise from other appliances and the Spanish electric grid, without being able to disperse it..
As a consecuence, "depending on the day" - and just even on the way the cables are routed on the desc - jitter can be as small as ±0.1 mm Y axis, ±0.2mm X axis with virtually no false clics. Or it can be virtually unusable, with continuous false clicks. It is a thick screen, at 13 mm, with CCFL lights. Relatively easty to strip and prepare. 8. Not sure, I still have to revise an alternative screen to see if it works better than this. This is a good screen, as good as as a CCFL can be, nonetheless, and a judicious use of lazy nezumi pro makes it a joy to use. UPDATE: Removing every other peripheric from the USB HUB integrated in the case and routing the USB cable, from it directly to a USB socket at the back of the computer, slightly reduced the Jitter and, maybe more importantly, made it more consistent - most of the time, in the "drawing area" ( 3 cm from th borders of the screen) the jitter is down to one pixel. Connecting other peripherals to the USB hub, or connecting the tablet through a hub, strengthens the jitter. 7. Beyond the numerous false clicks and general jittering, something inside the panel acted like a toroidal lens, so that there were two vertical bands in the screen where the horizontal movement of the pen was distorted. Once realized this, working on shielding it lost sense. 8. Not at all, at least with the Huion. 7. Initially, problems with "random daily jitter", solved using ferrites as common mode chokes on the USB and power cables. Added note: the inverter and the VGA board are mounted one beyond and the other almost beyond the limits of the Intuos; also , below the intuos is placed a sheet of aluminium foil. (update: the horrible fame that they earned notwithstandimg, I am stll curious about that monoprice...). 8. No, unless one has no intentions of doing colour works. Extremely late update - it's my PC graphic board, as it does the same with my new TV ). The Controller is attached to USB 2.0 to VGA Adapter (Photoshop has issues with them the issues are when moving the application on that screen with an already open drawing, as P.E. uses some double bufering strategy when it has a true graphic board in front, but Manga Studio works fine). 7. I still have to build the final case, so I may be forced to revise this post in the future. Final in assembled build, 1 pixel on the Y axis at 1 hz frequency, or less - usable with no stroke stabilization of any kind, anyway. Virtually no jitter from the panel ( worse case scenario, I will keep the controller out of the way... the LVDS cable is some 20 cm long). The Wacom driver check tool gives me no jitter at all on the Y axis, and at most a +- 0.05 mm on the x axis (hardly moves a pixel, with a frequency of about one movement per second). Drawing, feels like it is even less. 8. Very small, the 6 bits per colour channel make themselves feel, a bit of an hard-thingy to mod and do not even start if you do not have access to FCC extender for the LED's line (it a 0.5 mm pitch, 9 lanes flexible pcb... NJYTouch sells ZIT to ZIF extenders and cables now), but great viewing angles. Errata corrige: the jitter, really, is on the Y axis. to calibrate the monitors that I use to draw, and had way to compare each "X-Q" screen. Beyond its 6-bits nature, this LCD appears unable to cover more than 79% of the sRGB colour space (about 50% of the Adobe colour space). If you are interested in a build of this size, woodguy32 has produced very nice ones using the retina screens from the IPAD 3 &4, coupled with eDP controllers, that should have not only a much higher resolution and require less space, but also have better colours. 4. Monitor: LG IPS224v, IPS. LED, 1920x1080 - the LED strip heats notably the right border of the screen. 7. In view of my experience on the next build, it could be wise to plan for an update of its TCON-board RF cage, that I didn't cared too much for when I built it. In the center the jitter is down to a pixel, with a low frequency. On the right-left sides, the jitter is much more pronounced (about 1 mm). It has no provisions in the design to be taken apart, so expect to be forced to flip all the layers in the diffuser and end up with dust and light bleeds. On the other side, extending the LED lines requires only a modicum of soldering ability and materials. If needed, the FFC connecting LCD and board is a garden variety FFC with a latcher on one side - both are easily found on ebay. 8. Yes - it is wider than the tablet's active area, but it is a very good screen, internally it has about 40 cm of FFC connecting the HDMI/DVI/VGA board to the panel that simplifies relocating the board, the LED strip is powered through six individual cables about 1mm thick (with isolation), that were very easy to extend. The PWM probably uses a frequency low enough that adding the irregularities of the extensions, to the cables, didn't produce notable effects. 4. Monitor: LG 20mp48, IPS LED VGA only !. 7. There is an inductor in the TCON, at the bottom of the LCD, that is a powerful source of interference, and shielding the TCON is necessary, useful and requires a serious effort. Even with shielding in place ( a fully enclosing RF cage, made with the metal from the LCD back panel), though, the right forty mm of the screen are affected by a serious jitter, false clicks and pressure blots, though in a much more restrained form. Internally, between the VGA board and the LCD there is a whole 10 cm (!) long FFC cable, of the same type found in the IPS224v - 30 pins, 1mm pitch, flip-side with a latcher on one side and a ZIF on the other. The center of the screen hardly shows any jitter at all, so a clever disposition of GUI elements can still make it well usable. Update: adding common mode chokes and moving it to its final destination reduced the amount of false clicks to an acceptable level; also, the image quality is just gorgeous, and its relatively large dot pitch makes it easier for my eyes... I am really becoming short-sighted. Second Update: Changing the refresh frequency to 75 Hz reduced yet a bit the Jitter and the false clicks in the "noise zone", though it does not eliminate them; I didn't try before, because I had it as a "supernumerary" monitor under a USB-VGA adapter that did not allow it. 8. Yes And No; on one hand, it is a nice screen and it is - also - nice to have all GUI elements natively reachable without having to "carve out" screen portions with Power Strip. On the other, it is not really an improvement on the IPS224v. Also, to the cost of its purchase must be added that of the FFC cable that is needed to move the VGA board out of the way (6 Euros). It requires as good an RF cage around the TCON board as one can source and or build, so it is surely not recommended to anybody that has problems acquiring/building such an element. Finally, it only has one VGA input, which probably adds to its issues (the 224, which looks a lot like its "big, old brother", was much jittier and even clickier, when using the VGA). In all, the IPS224v is a better proposition, really, and used (after all, the very first thing we do is opening up the LCD to remove its metal blackplate, invalidating any warranty they may have) it costs about the same as this monitor that, being very recent, can hardly be found second-hand. [Supplementary note, after some months of use:] - picture quality is, actually, quite better than that of the IPS224v, as the mesh grid around the pixels is thinner and less intrusive, and, also it is actually brighter, while heating up a lot less (possibly also because RF cage reaches the LED strip and acts as a heatsink ). Additional Note: I finally bought a colorimeter (a DataColor Spyder4Express... the "Pro" version may be better - it supports multiple screens setups natively, but I managed a workaround to use the Express and the colour profiles it creates on different screens - all one need is a "changer" for the ICC format "internal description" and then manually set each screen with its profile), and I set forth to calibrate the monitors that I use to draw. 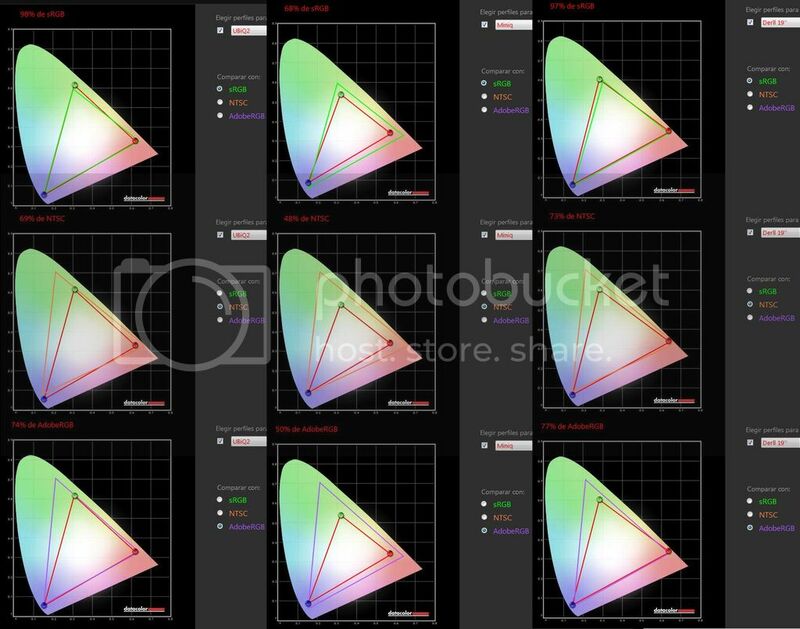 I have calibrated both these monitors and it appears that, color-wise they are pretty much the same... the IPS224v covers 96% of the sRGB space (74% of Adobe RGB), whereas the 20MP48a covers 98% of sRGB (76$% of adobe). I suspect, though, that most of the difference (the "lost" 2%) is due to the difference between the more neutral 2mm thick glass on the 20MP48 and the slightly more blue-tinted, 3mm thick glass I used with the IPS224v. 7. Note: the screen was already used with a 12x18 Intuos 2 (see entry above), and produced some more jitter with that, as the digitizer intercepted noise from its whole area (and its whole TCON-board length). Jitter is about one pixel, pretty "slow" in frequency, in almost all the available tablet space, with no false clics. The last cm near the upper lamp, jitter is more appreciable... but there are seldom useful GUI elements there anyway. 8. Yes, if one do not mind having 3 inches of unreachable screen on both sides, it still gives about 16,5" of drawing area in its middle ( 0r, 1070 x 1050 pixels) . I finally decided to buy a colorimeter, calibrated and profiled all of my monitors ( next time, Spyder [1-5] PRO is to be preferred, as it supports multi monitor, while the "Express" goes out of his way to avoid you using a different version of the profile it create for each monitors). Not sure if the colorimeter itself has not some instrumental derive, as they all seems a bit "orange" now... maybe I was just used to screens pushing out a bit too much blue (*). UbiQ2 and UBiQ3 ( LG IPS224v, LG 20MP48a ) have virtually the same profile, and are very similar to the Dell 19" that I thought to use as "repeater" in case UBiQ2 was worse. The LP097x02 SLEA (from the Ipad 1 - 2 ) of the MiniQ gets spanked in a horrible way (even by the stegosaurus of my monitors, the IBM 9493 I tried to use for an A4 build, that still manages a 77% of sRGB and a 59% of AdobeRGB against MiniQ 68%-50%... I forgot to take a shot of that, my bad). Further enquiries have led me to discover that these colorimeters are calibrated to emulate light from the Sun - at 6500 k - reflected by paper, as their purpose it to get the screens a bit closer to how printed photos would be seen in daylight, whereas most LCD screens are natively set to work with a colder hue - so that the profiled screens produce a "warmer" tone is simply to be expected. 7. I had a Intuos 2 12x12 lying around, my nephew gave me a LCD that he salvaged from his last dead laptop - it was an ugly TN thing, but it also had no metal backplate inside the screen area, its circuit board is in the same plane as the lcd - no need for modding - so I decided to try anyway. It is a bit more jittery than I care for, it has abysmal viewing angles, low resolution and it is wider than the screen active area by some 70 pixels on each side. 8. It is no IPS panel, but at 20$, who cares? It was from a scrapped tabletPC, and came with an integrated Wacom digitizer + touch-screen panel. driving the backlight needs to be extended - it is a 9 pin 0.5 mm pitch flexible PCB. Relatively easy to find, nowadays. The noise seems to be under the 0,1 mm mark, in either of the two tables I tested it on.